And it shall come to pass in that day, that the mountains shall drop down new wine, and the hills shall flow with milk, and all the rivers of Judah shall flow with waters, and a fountain shall come forth of the house of the LORD, and shall water the valley of Shittim (Joel 3:18). For, behold, in those days, and in that time .... (Joel 3:1). ..... we do hear them speak in our tongues the wonderful works of God. And they were all amazed, and were in doubt, saying one to another, What meaneth this? Others mocking said, These men are full of new wine. But Peter, standing up with the eleven, lifted up his voice, and said unto them, Ye men of Judaea, and all ye that dwell at Jerusalem, be this known unto you, and hearken to my words: For these are not drunken, as ye suppose, seeing it is but the third hour of the day. But this is that which was spoken by the prophet Joel; And it shall come to pass in the last days, saith God, I will pour out of my Spirit upon all flesh: and your sons and your daughters shall prophesy, and your young men shall see visions, and your old men shall dream dreams (Acts 2:11-18). This part of scripture is beautiful in irony! The multitude thought that the one hundred and twenty (including Mary, the mother of Jesus - Acts 1:14,15) from the Upper Room were drunk on sweet fermented wine (Acts 2:13), but instead, they were drunk in the new wine, the Holy Ghost. I think the most beautiful site in this world is seeing someone drunk in the Holy Ghost. Jesus also Prophesied "New Wine"
The disciples of John the Baptist asked Jesus why doesn't His disciples fast like they do and like the Pharisees do (Matthew 9:14). Jesus's first response is that while He was still physically with Him, it was a time to celebrate, and that after He was gone, they would have plenty of time to fast (Matthew 9:15). Jesus's second response (Matthew 9:16) was that the Law (the old garment) could not be joined with the Gospel of Jesus Christ (the new garment). The Pharisees represented the Law and as we know they refused to accept the gospel that Jesus taught. 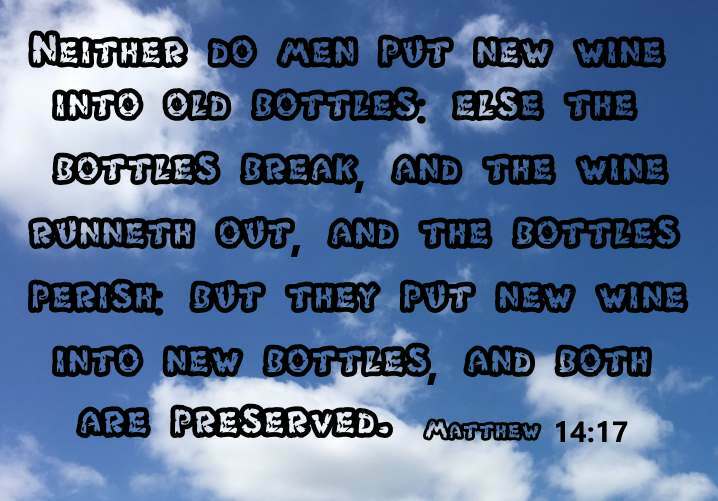 Neither do men put new wine into old bottles: else the bottles break, and the wine runneth out, and the bottles perish: but they put new wine into new bottles, and both are preserved (Matthew 9:17). If any man thirst, let him come unto me, and drink. He that believeth on me, as the scripture hath said, out of his belly shall flow rivers of living water. (But this spake he of the Spirit, which they that believe on him should receive: for the Holy Ghost was not yet given; because that Jesus was not yet glorified) (John 7:37,38,39). If you are reading this and you want to be full of the "new wine" becoming a "new bottle", I pray, in the name of Jesus, that you obey the Gospel of Jesus Christ.